NEW YORK -- Before the puck drops every night at Madison Square Garden, the fans hear a phrase so simple and yet so important to the men on the ice wearing blue. As the franchise kicked off a week of celebrations for its 85th anniversary Friday night, players past and present reflected on what that statement meant to them as they gathered at the NHL Powered by Reebok Store on New York's Sixth Avenue and at the ice rink in Rockefeller Center a few blocks north to get the organization's birthday party underway. 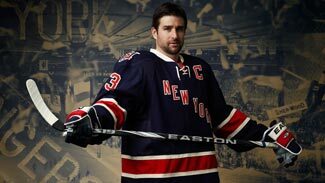 The highlight of Friday night's event was the unveiling and release of the Rangers' new Heritage Jersey, which will be worn for the first time when Original Six rival Boston comes to Madison Square Garden on Nov. 17. As crowds bedecked in blueshirts packed both events, Rangers memorabilia on loan from the Hockey Hall of Fame, as well as game-used jerseys dating back more than six decades lined the walls, and the impact was not lost on the players who currently call the Garden home. "You can't help but have a good feeling, and maybe a little bit of a chill, understanding how much history there really is here, and what players have played before you," center Brandon Dubinsky said. "I think it just gives you a great sense of not only respect, but also pride and the importance of what it means to put on the jersey every night." Current Rangers like Dubinsky, Michael Del Zotto and Henrik Lundqvist, who were all in attendance, didn't need to look far to see that history. Friday's gathering featured players from several generations of New York hockey with Hall of Famers Rod Gilbert and Eddie Giacomin participating in the festivities along with memorable stars like Brian Leetch and Adam Graves, who helped to end New York's 54-year championship drought in the 1994 Stanley Cup Final. Rangers alumni are common fixtures around the organization, whether as visitors or members of the front office, and often the impact continues beyond their playing days. Tips on how to perform on the ice are par for the course, but often the connection between former and current players touches just as much on the intangibles of the game. "There's always little things you can try to help them out with," Graves said Friday. "But for the most part it's support and taking interest and trying to guide through positive reinforcement of what they're doing great, and again, speaking to what a privilege and opportunity it is to be a part of this organization and reinforcing that aspect." But imbuing a sense of pride and a cognizance of red, white and blue is hardly the only thing passed down through the generations. For others, simply understanding the changes in the game, and the bonds that are created by a shared experience strengthen what the players of the '60s, '90s and the current day have in common. "It's definitely a different game now," Lundqvist said. "What's more fun is just to hear old stories -- how they traveled, how they approached things and the little playoff stories they had, but in the end it all comes down to where you talk about respect and honor and the good things about this organization, and they're so good at keeping it. Having a night like tonight really shows it." Lundqvist has a better understanding than most about that tradition. As a clear fan favorite, he is seen by many in a line of Ranger goalies that includes Giacomin and Mike Richter, who both have their numbers hanging from the Garden rafters. Being a goaltender is among the most pressurized positions in all of sports, and being one in a city like New York only adds to the weight each Ranger carries on his back when he mans the crease. Few are the number that can understand what Lundqvist experiences when he takes the ice. "Henrik Lundqvist and I feel like we're old friends," said Giacomin, who played goalie for New York for 11 seasons. "I've only met him three or four times, but every time I see him, he glows and I glow. It's a special bond. "When I put that uniform on, I stepped on the old Madison Square Garden on 49th street, I stepped on that ice my rookie day, and I was in heaven. This is what I try to tell these players now. When you put that uniform on, you've made it. Now, it was hard to make it, but it's even harder to stay on with a team." As the senior representatives Friday night, Giacomin and Gilbert seemed almost more in awe of the franchise, its current players and its dedicated fan base than anyone else. Gilbert, whose 300th-goal puck was on display among the artifacts Friday, credited the passion of the fans as well as the players in being a significant part of making the team what it became, noting that when he first suited up as a Ranger at the age of 18, the fans were so knowledgeable that they "knew how many siblings I had." What most struck the two Hall of Famers, however, was that the new jerseys unveiled Friday don't just bring a sense of the franchise's history with them on the outside, but with each of the team's retired numbers sewn into the bottom hem, they do so on the inside as well. With touches like that from the organization, the job of making the younger players understand what it means to be a Ranger is easy. "They know the tradition, and when they feel it, when they wear that jersey, they feel that responsibility," Gilbert said. "They have my number inside. Every player that's going to wear it, they're gonna carry my number.